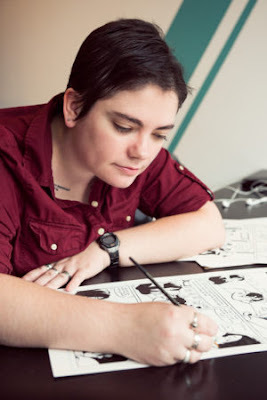 Portland Panel Pal Kel McDonald is doing back to back shows, starting at Rose City Comic Con in her home city on September 8-10 and then heading out to the Small Press Expo in Bethesda, Maryland September 16th and 17th. 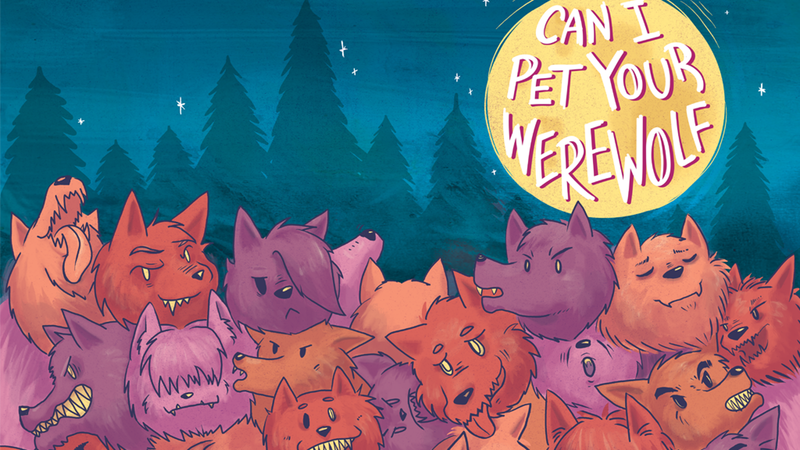 An incredibly prolific creator, Kel not only has her own large body of work, such as Sorcery 101, Misfits of Avalon, and The Better to Find You With, just to name a few, but also is a frequent editor, including the Fairy Tales series and the newest collection, Can I Pet Your Werewolf? Listing them all would take an entire column, but you can find out more at her website. 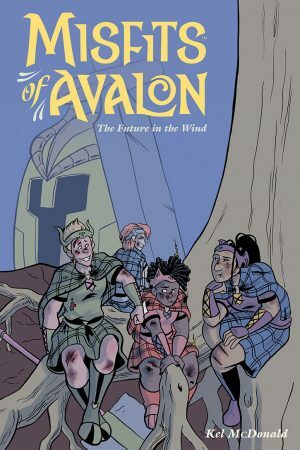 Rob McMonigal: You just wrapped up Misfits of Avalon, about a group of unlikable girls who have to come together to save the day. Sort of. How did you come up with the idea for Misfits, and what made you decide to do something with an existing legend? Kel McDonald: I started with magical girls that are jerks. I felt girls and women often don't get the space to be unlikable the way boys and men do. But some of my favorite characters are about broken complicated unlikable people. Misfits of Avalon is supposed to be a team of girls who aren't fitting what we usually have as leads. When I made the team I originally thought to do something based on punk music but didn't know enough about music in general never mind punk music specially. I decided to go with Arthurian myth because legends and lore have always interested me and it helped give a structure to the story. Rob: Spekaing of King Arthur and its associations, why do you think so many comics creators, from Bronze Age Marvel to Camelot 3000 to, well, you, continue to work within or alongside the legends we already have? Kel: King Arthur myth works because while it's very straight forward it doesn't give much reasoning for a lot of the characters' actions. It leaves a lot of room to pull at things to explore while giving a pretty good structure. Rob: Another project of yours just finished up, Can I Pet Your Werewolf? It makes sense that you'd spearhead a werewolf anthology, being an expert and all. 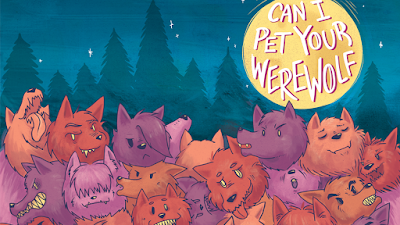 How did you pick the creators and what makes this a book werewolf fans need, beyond the title? Kel: I tried to pick people who don't usually focus on werewolves but I knew would be interested. I have read a lot of werewolf books and even though I like them, there were some problematic treads going on. There is stuff like stories that encourage stalking or controlling behavior. I wanted some werewolf stories were those were avoided. Also the Alpha wolf idea is from out of date research on wolf behavior. Real wolf packs are just a family unit, so I wanted more werewolf stories with that angle as well. So I just wanted werewolves pushed in a different direction. Rob: By the way--how does one get to be a werewolf expert, anyway? Kel: Read a lot of werewolf stuff. Clearly. Rob: You're one of the busier creators I know, with multiple projects going on at once. How do you structure your time to ensure you get it all done? Any particular management tools or do you work within your own system? Kel: I usually have certain days be for certain tasks. So like today is only for writing stuff and one day is only for penciling or inking. It helps prevent me getting burnt out on one task. It also helps because if I get stuck at one part I have something else to work on to work a different part of my brain. Rob: What can people purchase form you at Rose City and SPX? Kel: Sorcery 101 omnibus(omnibi?). It's my completed webcomic about an inept sorcerer learning magic from a grumpy vampire. Also Cautionary Fables and Fairy Tales, which are fairytale anthologies where each volume focuses on a different region. Plus Fame and Misfortune, which follows a lesbian bodyguard with magic powers protecting a spoiled celebrity. 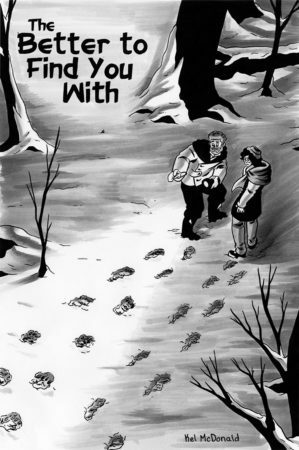 Also The Better to Find You With, about a werewolf and a veterinarian solving a small town mystery. And Misfits of Avalon, which is about magical girls that are jerks. Rob: Whew! I told everyone it would take a long time to list all your credits! Lastly, what's next for you? Rob: Thanks again for taking the time to do this. I hope lots of people come see you at both shows! Can't make Rose City or SPX? Kel's website is here.